i'm in love with prince! the prince brand i mean, prince tennis racquets, prince caps, prince duffel bags ... neither of which i own. now i envy my sister, today is the first day of her milo tennis clinic. and wait... they have new rackets! 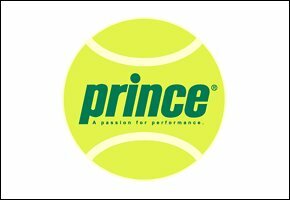 PRINCE RAQUETS! what the hell? why don't i get to have one? stupid leeeegggggg!!! i'm stuck at home, i just finished doing the laundry... and i'm glad i did despite the water shortage. yesterday we went to buy my sister's racket grips. mom says we're not gonna buy anything aside from those and a pack of bread. but while in the sports house i can see her pulling out her credit card. it seems like she's buying the bicycle type gym equipment... and she did. later that night was quite amusing, all four of us in the family are excersizing together. mom playing with her new equipment, dad jogging on the threadmill while reading 'dangerous prayers 3', my sister practicing a couple of her tennis skills and i playing tennis with the wall. it was fun, our roofdeck was turned into a mini gym with 4 exclusive members.